Room 6A is a round kiva structure built into Chacoan Room 6W after 1125. 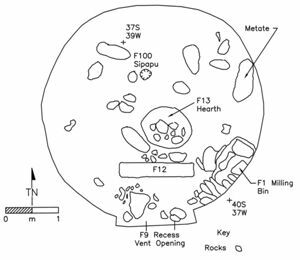 It has a diameter of 4.7 m. Twelve stratigraphic units were identified, including post-occupational fill units, structured trash, a roof-fall layer and a floor unit. Fourteen features were associated with 6A including pilasters, a central hearth and deflector, a sipapu, encircling bench, a wall niche, a southern recess, and a above-floor ventilation tunnel. Based on the masonry style and the ceramics present, the room was built by the San Juan occupants during the late 1100s or early 1200s and was probably used until the end of the occupation in the 1280s.